As always, she was passionate about the topic (her specialty of course) and full of energy. She began the two-hour discussion by mentioning that after years of attending a Reform congregation in Washington Heights, she now is a member at the Conservative Synagogue of Riverdale, NY. 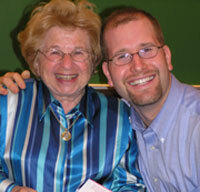 Welcome to the Conservative Movement Dr. Ruth and I look forward to seeing you at my graduation on May 20!